When I first started reading this one I wasn’t a fan. Since it was an eGalley I thought I was missing the beginning because it just seemed to jump right into something without any background knowledge about what had happened. It made me feel like I missed something entirely. Not in a Marchetta kind of way, but more in a, “I’m missing chapters” kind of way. But since I requested it from Edelweiss I knew I needed to give it the time and attention it deserved so I pushed on. And I must say I was pleasantly surprised when all was said and done. I actually found Find Me entertaining when I finished and I was pleased. 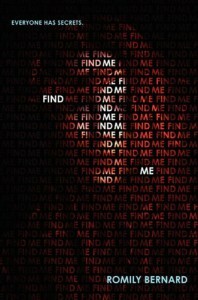 Find Me is about Wick Tate, a girl basically from the wrong side of the tracks. Her dad is on the run for drugs, her mom committed suicide and now Wick and her sister Lily are living with a foster family while and annoying cop keeps a close eye on her. But Wick has a secret of her own. She is a hacker and she isn’t always on the up and up. Now worried that the police are on to her Wick’s back is up. And when a diary of a classmate that has just died shows up with “Find Me” written on it Wick has a whole other problem to deal with and it is closer than she thinks. Like I said in the beginning, I didn’t think I liked this book all that much. But as I read more and more, Wick started to grow on me. She was funny, sarcastic, smart and 100% loyal to her sister. As a reader, I appreciated that. She took on the role as parental figure for Lily, even though they had foster parents, and never looked back. I found that very admirable in a main character and it made her all the more likable. Also her relationship with Griff was really enjoyable to read. It added some romance-like tension and so adorableness because Griff was adorable. And the two of them had a great dynamic together. Wick was certain about a lot of stuff in her life, but Griff was not one of them. Now on to the story. It was supposed to be a mystery, but like I said when I was reading it I figured out pretty early what was going on and who was behind the whole thing. I thought it was very obvious from the get go so it kind of failed in that respect. But even knowing what was going to happen I still thought the story was well thought out and timed. It wasn’t rushed but it didn’t drag. There were definite giveaway with some of the clues dropped, but that was okay for me because Wick as a character made it okay. All in all I really ended up liking Find Me. It was a quick read with likeable characters and a well paced story. Take out the mystery aspect, which was a fail in my opinion, and you have a pretty solid debut novel that I’m happy I didn’t throw the towel in for. I would recommend it for sure.